Pretty and tempting cookies! I am a sucker for citrusy and iced cookies. Lisa, I just wanted to let you know that those chocolate caramel bars from the cookie swap were outstanding! Meredith: Thank you! So glad you enjoyed. First, would you believe I haven't done any holiday baking yet? What gorgeous little cookies! They'd be a wonderful addition to a Christmas cookie plate. I love those Mandola's cookies! I can never leave without a half dozen. I had thought about trying to find a recipe to make them at home. Now I know where to look. Yours look perfect! You had me at lemon. I was totally hooked at "glaze." 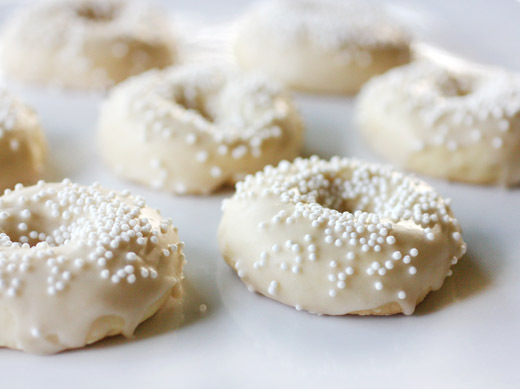 I want to make these - eat these, I mean - right now. I hope this recipe's still online. Hope hope hope. Well...I will have to add them to my list of new cookies to try this Christmas. They look delicious and so pretty. Thanks! These cookies would be a welcome addition to my holiday baking. Love the lemon flavor and also the shape of these cookies. Cookie elegance! Sometimes there is just so much chocolate, peppermint and holiday spice; lemon would be delightful. these are too cute! i love the glaze on it, they kinda look like little donuts to me:) thank you for sharing this and have a great weekend. 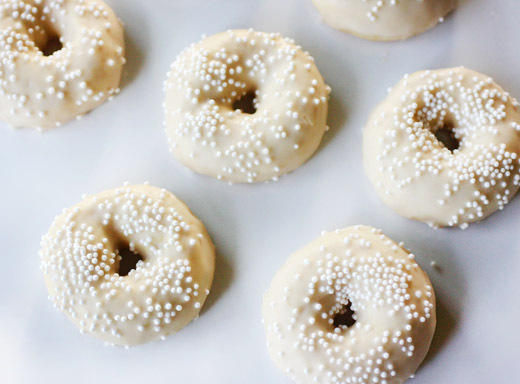 I love the idea of making them into a wreath shape and then sprinkled with green leaf shaped and little red balls nonpareils. My 3 yr old would love the whimsy of it. I'll have to try these. I enjoy a lemon "melt away" with a similar recipe so I will enjoy this shape and texture variation. Ha, I have been baking cookies too but certainly not half as pretty and Christmassy as these beautiful wreath cookies! Stunning and festive and oooh love anything lemon! Great recipe, Lisa! Oh my kids would love these. So pretty! And lemon is a nice welcome bright flavor at this time of year. I find so many "Christmas cookies" to all kind of taste the same. These would be a lovely addition to my gift bags! Those are like mini lemony doughnuts ;-)) very pretty! These look absolutely divine. I tend to pass up many a cookie during the holiday season but no way would I pass this one!! I love anything "citrucy". I've made a lot of cookies the past days but only looking at them and drooling.. you know why. I wish I could eat some of these. what a great and appropriately festive idea! it seems like all the cookies on the typical christmas tray are so heavy and rich, this is a great alternative! they are so beautiful lisa....happy holidays ! 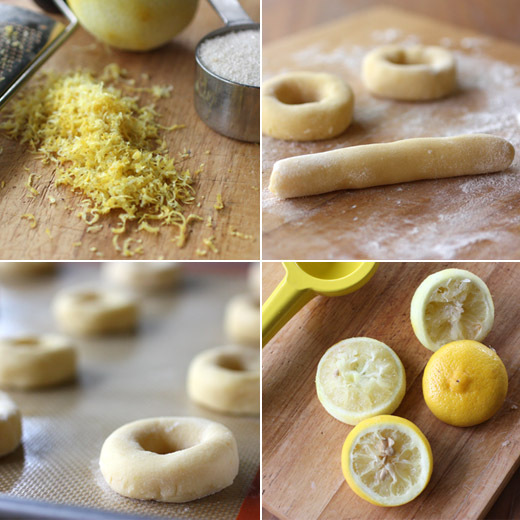 Glazed lemony cookies in the shape of little bite-sized doughnuts: Dangerously delicious. These look beautiful Lisa :) I'm making biscuits and nougat gift boxes for friends and family. These would make a beautiful addition! These little cookies look beautiful! I've seen these several times in cookbooks and in magazines, and now i must make them. Lemon is such a nice way to brighten up the holidays. I love anything with lemon! These are so cute and a must try! I have just pinned them. Happy Holidays!! I just love citrus flavored anything, so these sound great to me! I love lemon anything and I am thinking i need to fabricate an excuse to do some more cookie baking. These sound amazing.